As first reported by USA Today, Harlem Heat is going into The WWE Hall of Fame for 2019. I recently spoke with Booker T while at The Big Event in New York City. Booker T is the first African American to be inducted into the WWE Hall of Fame twice. SK: When the Shockmaster broke thru the wall, and he fell, you were standing there with The Bulldog, your tag team partner Stevie Ray, Ric Flair, and Sid Vicious, what went through your head when it happened? Booker T: It's crazy here being at The Big Event here in New York. I'm looking across the room at Sid Vicious, who actually brought me into WCW. He was on stage with me that night. I think I remember what Sid said more than anything. I think Sid said, "Oh God." I was a green kid. It was my first interaction as far as something with that magnitude. I had an angle with the top guys like Sid Vicious, Vader, my brother and myself, that's kind of crazy. Then when Shockmaster did that, it was something I definitely didn't expect, and I was so green, and I did not know how to handle it other than to be in total shock myself and try and still look tough. Trying to do those two at the same time is kind of like juggling and driving a car at the same time haha. SK: The British Bulldog was standing next to you that night, and speaking of The Bulldog, you supported the campaign to go into The Hall of Fame. What was that like for you to support a fellow wrestler who stood beside you, worked with, and to want him to go into the Hall of Fame? Booker T: He's a brother man. He's a brother that put a lot of work into the business. He ran up and down the road, did those strips and slept in a car sometimes, barely getting sleep in hotels, all those plane flights, thousands and thousands of matches. When somebody put the work in, especially before me, I respect those guys for paving the way, especially from a tag team perspective. So, to put my stamp of approval in there, it was the least I could do I think. SK: How did it happen and how did it feel going into The WWE Hall of Fame? Booker T: I got the phone call, one of the office guys, I don't want to say his name or anything like that, but I always thought I was too young to go into The Hall of Fame. I was like, "I'm not old enough. I don't have enough grey hair yet. I might have a few matches still left in me." I just didn't feel like I was ready to go into The Hall of Fame. After I've sat back and looked at my body of work, thought about it, I go, "Wow, I guess I am a Hall of Famer." I never really thought about it along the journey. You got to put in the work first before you can ever think about ever dreaming or imagine making it to that point. I don't think it's up to you to say you belong in The Hall of Fame, that's up to someone else. After it happened, I said, "Wow, I'll expect it, and I'm gonna take it with me to the grave." Hopefully, I get to go in one more time as a tag team with my brother one day. 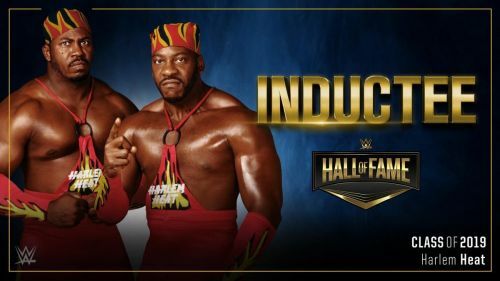 We here at Sportskeeda would like to congratulate Harlem Heat for getting inducted into The WWE Hall of Fame. We'd also like to congratulate Booker T on becoming the first two time African-American into The WWE Hall of Fame. Below is the audio to the interview.